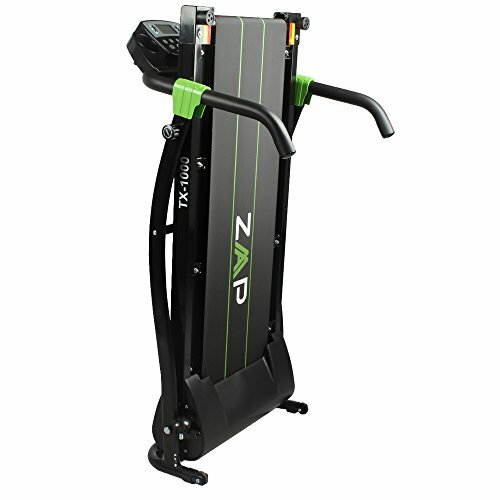 Summary: Zaap already produce one of the best-selling vibration plate trainers. Judging by the spec and price point, the Zaap TX1000 home treadmill could be a popular option too. This is a beginner to intermediate level model. It has a top speed of 10km / hour. The 750-watt engine, multi-function display with 12 built-in programs and folding design are all noteworthy. So far, the feedback has been positive too. Check out the full gallery, and comments from previous buyers over on the dedicated amazon.co.uk product page now! 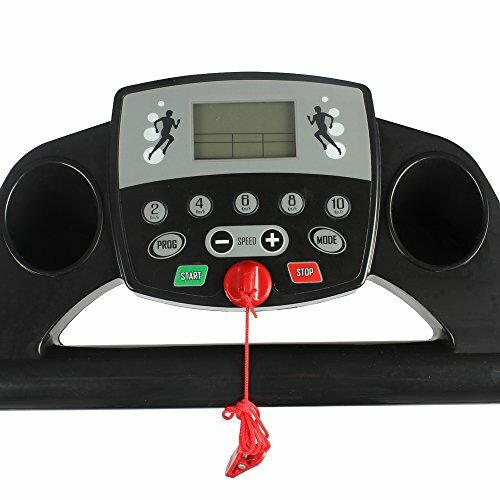 You’ll get a solid mid-size treadmill, with a smart black and green design, it includes safety handles, and a console area which is bigger than for many cheap treadmill models. The total weight is 26kgs, and the size is 127cms long, 60cms wide and 119cms high. It folds, and moves around via small inbuilt wheels. This is always a big plus for me, treadmills you can’t fold are hard to move and do take up a lot of space. The ZAAP TX1000 is built solidly, and can ‘officially’ take users up to 19 stone (120kgs). There is a standard emergency stop clip. You clip this to your clothes, giving a way of automatically stopping the treadmill if you fall off. You’ll get a tiny amount of incline with this model. The speed settings go up to 10km / hour. This ranges from a slow walk to a run or jog (depending on your size and fitness level). This is plenty enough for most of us. If you are fitter and feel like a more challenging run – then you’ll need to find treadmills that go up to 12km / hour. Electronics are the LCD type (you’ll need to spend a couple of hundred more to get a colour LED monitor). This displays all your vital measurements. You get speed, time, distance and that all-important number of calories burned. There are an impressive 12 pre-set programs. This should cover all types of runner, from absolute beginners up. Separately, you will also get 5 quick-select buttons for popular speeds. This makes the Zaap TX1000 a lot less fiddly ‘on the go’ compared to other budget treadmill models. What Previous Buyers Said About the ZAAP TX 1000 Power Pro Treadmill? You might think ‘fine’ is one of those words… however this is used over and over in the comments from buyers, mostly in the context of a 4 or 5-star rating. I have the feeling that people knew this was a budget model. With some treadmills you get the idea that people expected to get something like the Nordic Track model from the local gym. Realistically, a couple of hundred is going to get you a solid, practical model – like this one! Several buyers mentioned that it is easy to assemble. The narrower running surface was mentioned, though did not appear to be a big problem. For me the best comment was from the 73-year-old pensioner who is using one… this is worth a visit to the page to check out all on its own! 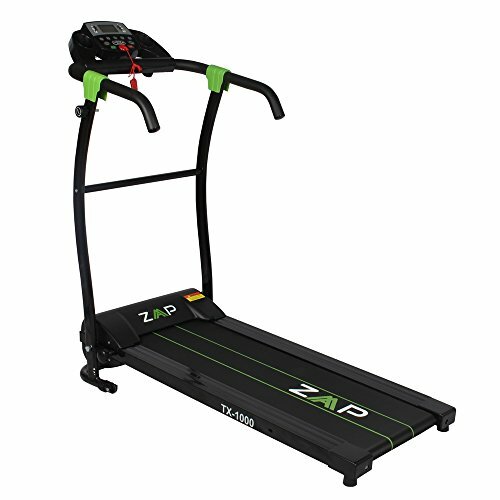 Wrap Up: Is the ZAAP TX1000 A Good Budget Treadmill? 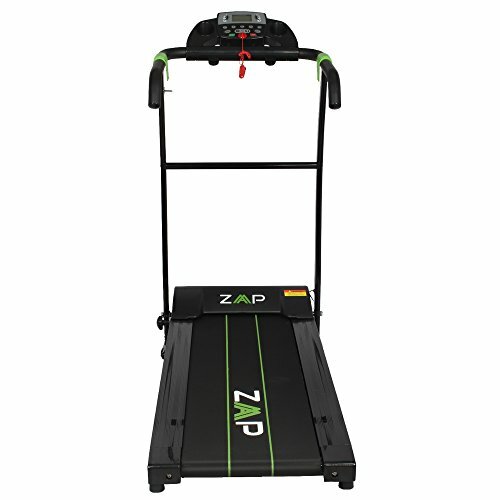 ZAAP are starting to make a name for themselves in other areas, and this is one of two treadmill models which are starting to be found. The spec is excellent for the cheaper price point, and the fold-up design a big plus too. This is not the right model for keener athletes. If you are starting out with home fitness, or happy to jog or run slowly to burn some fat, then this is an excellent choice. Check out the full gallery (plus the pensioner’s comments) for yourself over on the dedicated amazon.co.uk product page now!